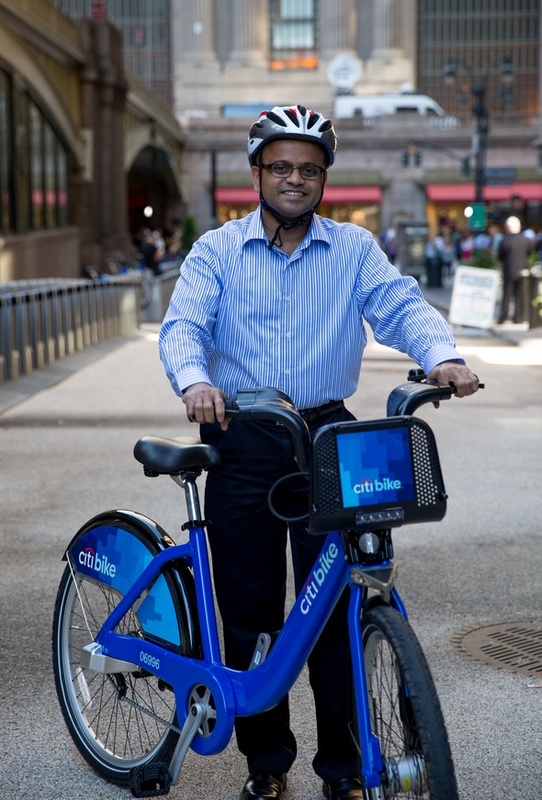 This wraps up Dmitry Gudkov’s series of bike-share-themed “Why I Ride” profiles on Streetsblog. Thanks Dmitry! From here on out, it’s just random chance if the subject of a “Why I Ride” post is smiling next to a Citi Bike. See now a guy like Sri is clamoring for more bike lanes. Before bike share he probably didn’t think twice about biking in the city. I received a $270 fine today for a red light violation in Tribeca. This morning my morning Citibike commute was ruined by a NYPD officer (who was in an unmarked car) who issued me a citation for not stopping at a red light. This was in a quiet neighborhood in Tribeca (Hudson and Franklin). I actually did stop at the red light. I let the three cars crossing over Hudson Street pass by, and as there were no more cars coming down Franklin, I crossed Hudson to continue on my way. This is when the unmarked NYPD car (who was the last car of the three crossing on Franklin) swerved left onto Hudson and pulled me over. I just couldn’t believe it. Dumbfounded. No warning, either — just a straight traffic ticket for who knows how much money. I’ve been riding bikes here in New York for years — never have I seen anything like this. I think it was pretty clear I was targeted for riding this Citibike. The NYPD must hate the program or have a quota to meet. I don’t think I want to ride a bike here anymore if this is how things are going to be. Do the same thing motorists do-say you lost control of the bike and it went through the red light. On a more serious note though, I’m personally not stopping for anything but a marked police car. An unmarked car could be anyone-bike thieves, kidnappers, terrorists, etc. The police should be required to use only marked cars when making traffic stops. I get the concept of using unmarked cars for other types of police work, but not for making routine traffic stops. As I said, many people will see an unmarked car chasing them, think WTF, this must be some nut case, and flee. I am so sorry this happened to you. It is a $190 ticket. There are $80 of surcharges that only apply to motor vehicles and not to someone on a bike otherwise it would be $270. However, it is completely absurd that you got a ticket for a safe behavior even though it was technically illegal. I got a red light ticket while on a regular bike (not a citibike) for a very similar situation to what you describe. The NYPD unfortunately tickets all riders, not especially citibike riders. It is a terrible waste of police resources to spend time harassing safe behaving bike riders just because the NYPD can cite the riders on a technicality. You can mail in your ticket and plead not guilty. You will be given a court date. You can explain to the judge. Maybe the police officer will not even show up. It might get dismissed or might get reduced in amount. It’s hard to express how much joy I feel riding a bike through our city. I hadn’t been riding since my bike was stolen last year (second time that’s happened since I moved here in 2005), so I was excited about Citibike knowing theft wouldn’t be an issue. Since I got the Citibike key earlier this month, I’ve only taken the subway a handful of times. Every day I’ve rode to and from my office, each time taking a slightly different route; and every day was a reminder of just how incredible this city is; a reminder of how lucky we are to live here. There is no better way to fall in love with a city than to ride a bike through it. You don’t get that experience going underground or sitting in a cab. I’m so upset because I feel like all that joy has been robbed; and I’m just as angry today as I was yesterday. After I got the ticket and started back on the way to my office, all I was looking for was the next NYPD officer who was going to target me and find an excuse to slap me with another $190 fine (or is the second offense even more expensive?). There was one stretch on 38th st where the road was completely blocked by a UPS truck, so I had to jump on the sidewalk for 50 feet or so. Was I going to get a ticket for that? I had to go half a block in the opposite direction to traffic in order to park the bike. Would I get a ticket for that? The bike lane on ninth ave was blocked by a cab. Am I going to get a ticket for swerving around? I plan to plead not guilty and see what happens, but so long as the NYPD is targeting safe and innocent riders, I’ve lost all desire to get back out there. I’ve already passed up three Citibike rides I normally would have taken and I don’t know the next time I’ll feel up for it. I haven’t gotten any tickets, but I’ve had bikes stolen, which is also frustrating and expensive. I try to look at it from the “glass is half-full” perspective: by using a bike for transportation, I save hundreds of dollars per year in transportation costs; if I have a bike stolen or get a ticket on occasion (say once a year), it will eat into my savings, but I’ll still be ahead. I try not to break the law, but sometimes the urge to run a red light can be irresistible. 😉 It does feel silly, however, that when I choose to run a red light, I spend more mental effort on looking for possible police cars than for pedestrians or other traffic. I do worry that I might crash into something or someone while I’m looking over my shoulder to make sure there are no cops behind me. Which is why I try to resist the urge to run red lights in the first place. Crossing at red lights when there is no crossing traffic is also a safety issue. It allows me to get a head start on the cars in my lane and spend more of my commute on open roads. If I am forced to stop for the entirety of a red light, I’ll spend more time stuck in among the rest of the cars and will be more likely to get hit. Enforcing this rule is not about safety and will lead to more accidents. I feel exactly the same way. Thankfully, I ride only late nights and in Eastern Queens, so I’m not in an area/time where I would be on police radar. I still religiously look for police when approaching a red light, but I rarely see any. Besides the safety reasons you gave, when you sit at a red light you’re forced to breathe the exhaust fumes from all the idling cars. That can’t be healthy. It’s a shame NYC doesn’t have sane cycling laws, such as allowing cyclists to treat red lights or stop signs as yields. Hopefully once enough people ride we’ll have the political power to get the law amended to end this arbitrary ticketing for once and all. You’re 100% correct, this serves no safety or purpose. It’s all about harassing cyclists so they give up in disgust and stop riding, which is exactly what those instigating the police to ticket cyclists want. The scooter company crunches the numbers to claim that tens of thousands of people will benefit from, why, Bird, of course!